Mr. Roncero in The Lost and Damned. 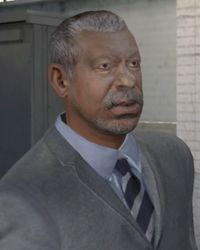 Mr. Roncero is a minor character in The Lost and Damned. Mr. Roncero was one of the employees along with Chad at the rehabilitation centre trying to help Billy Grey overcome his addiction to heroin. He seems to dislike Billy, and warns him to stay out of trouble or he's going to end up in jail. When Billy replies with a smart alec remark, Roncero makes an advance towards Billy but stops, and goes back inside. He is never heard from again after this point. Mr. Roncero is voiced by Jose Ramon Rosario. This page was last modified on 27 October 2013, at 15:25.